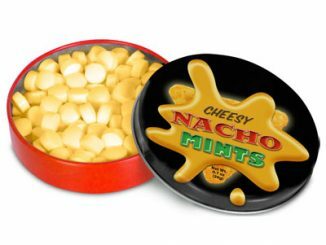 While just about everyone is familiar with the Ed Hardy brand of clothing (especially the t-shirts), it may be news to many people that there are Ed Hardy Energy Snacks. 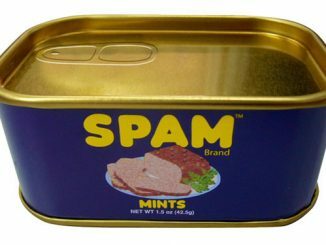 They have a nice variety too including mints, chocolates, and energy sticks (similar to Pixie sticks). What is really cool that they sent GeekAlerts a sampling of these snacks to test out, giving me a change to taste them all and write up this Ed Hardy Energy Snacks Review. 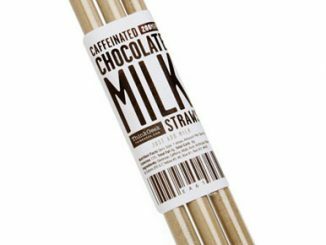 We’ve already seen a variety of caffeinated snacks including Brownies, Popcorn, Mints, and Marshmallows (in addition to countless different energy drinks), so this isn’t a brand new concept. However, besides for offering a nice range of delivery vehicles (i.e. types of snacks and flavors), Ed Hardy energy snacks stand out by being highly caffeinated (much stronger than some of the products out there) and being packaged in a way that makes them easy to take with you. 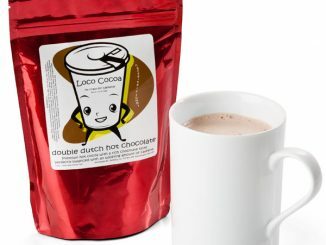 They aren’t bulky and heavy, they don’t need to be kept hot or cold, and unlike any beverages, you can take them through airport security. Overall, geeks have always liked caffeine, from coffee and Jolt cola to Red Bull and Monster energy drinks. Everyday I drink a steady supply of Red Bull, Mountain Dew, Diet Coke, and coffee. Generally I have easy access to these drinks, but I was excited to test out these Ed Hardy energy snacks to see if they would make a good alternative option for my caffeine fix. 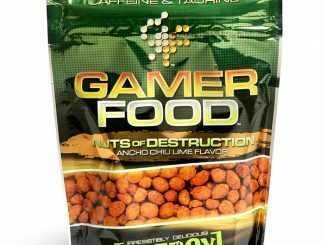 It turns out they are, as each snack is loaded with an ample amount of caffeine. 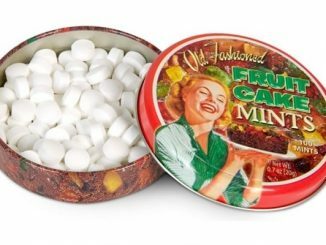 Each box of chocolate or coffee rocks contains 600mg, each tin of mints has 775mg, and the box of energy sticks contains 240mg. 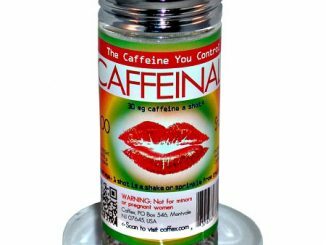 (By way of comparison a cup of coffee is about 100mg, a can of Red Bull is 80mg, a can Mountain Dew if 37mg, and a can of Diet Coke is 30mg.) Obviously these Ed Hardy snack packages contain multiple servings, as it is too much caffeine to consume all at once. 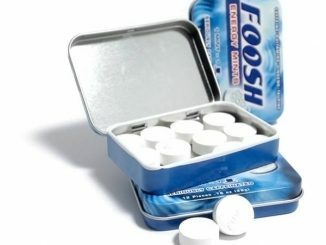 This is nice, because you can put a small tin of mints or a little box of chocolates in your pocket or backpack to have easy access to a series of energy boosts throughout the day or week. In addition to packing plenty of caffeine, it feels like it is quickly absorbed into the bloodstream. I’m not sure it makes sense biologically, but it sure seemed that the energy sticks and mints were very fast acting. So these Ed Hardy snacks contain plenty of kick, but how do they taste? 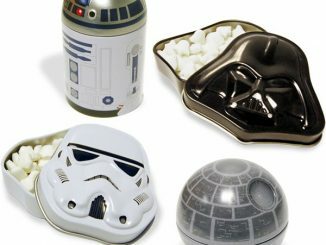 To me all of them taste good, with the Chocolate Rocks being my favorite. (How can you not like chocolate?) However, although they all tasted good to begin with, there was an unpleasant aftertaste with some of them, similar to what I’ve experienced with other highly caffeinated snacks. Fortunately, I didn’t experience this aftertaste with the chocolate rocks. 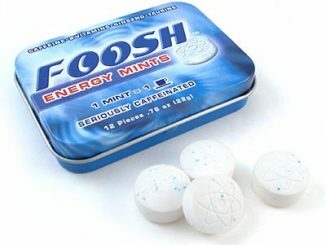 On the other hand, despite the aftertaste, I really liked the convenience and portability of the mints and energy sticks. 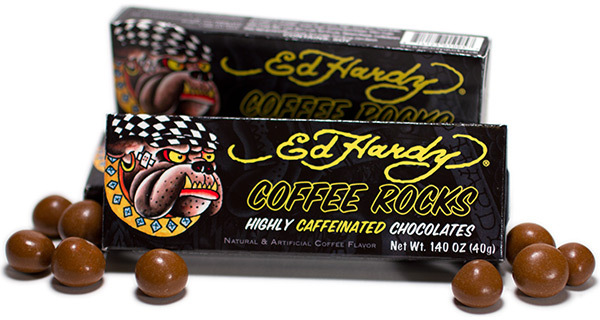 Ed Hardy Energy Snacks are available from EdHardyShop.com. 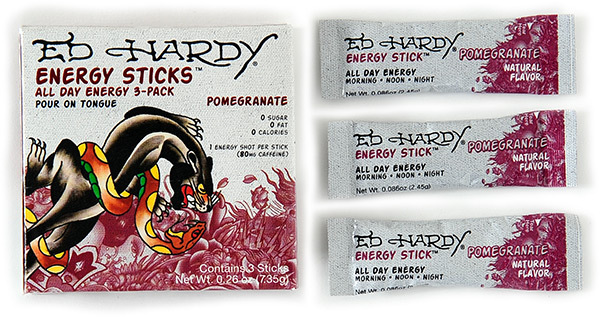 Ed Hardy Energy Sticks cost $3.29 for a package of 3 (three 80mg servings) and are available in orange and pomegranate flavors. 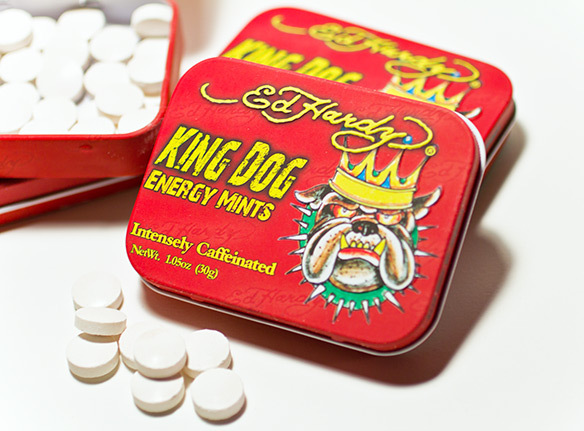 Chocolate Rocks and Coffee Rocks 3-packs (600mg/box for a total of 18 cups of coffee equivalent) are available for $8 each, while a 3-pack of King Dog Energy Mint Tins (775mg/tin for a total of 24 cups of coffee equivalent) costs $10. When you compare it to the equivalent number of Red Bulls or Starbucks you would need, these Ed Hardy energy snacks are a very good value. I buy the energy mints weekly. Whenever I need recharged (every 2 hours:) they work marvelously darling. The chocolate rocks are good too. 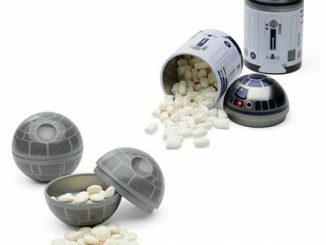 try the chocolate rocks as they are extremely tasty.